"Dreams of an Ancient World "
Front Cover Art (of folder). a[art2, pg 58]-Richard Corben. Color. In this version less branches in the tree. Plate #1: "The Sword "
1 plate. a[art1, pg 22]-Richard Corben. Color. Painting before Bodyssey's "Pilgor and Boonthas". Plate #2: "The Snow Creature"
1 plate. 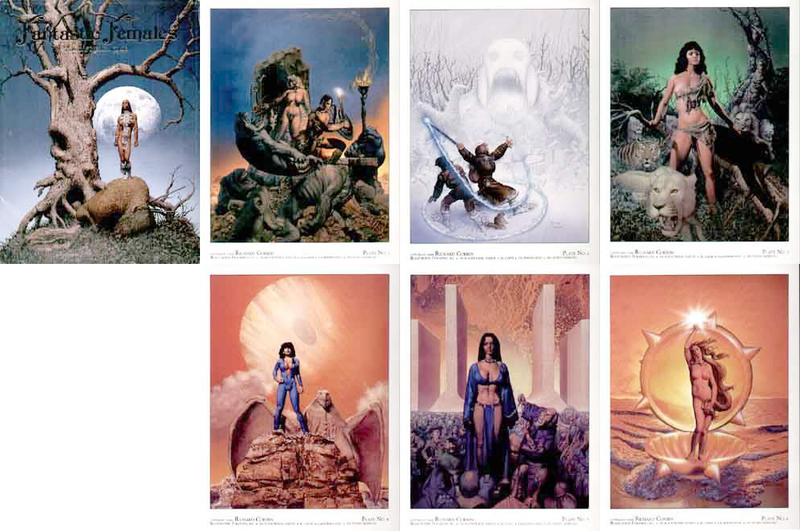 a[FiF, pg 177, art2, pg 23, CI-card #P2]-Richard Corben. Color. Plate #3: "The Cat Girl "
1 plate. a[art2, pg 31]-Richard Corben. Color. The cat girl with big cats version. Plate #4: "Jovian Blue Girl"
1 plate. a[art2, pg 49]-Richard Corben. Color. Woman has opened arm, but no child in it - reworked from "Fireship" (baby version, FiF, pg 181). Plate #5: "The Slave Girl "
1 plate. a[FiF, pg 163, art2, pg 28-29, CI-card #71]-Richard Corben. Color. Original version - before time ruined original; there is also revised version of this painting. 1 plate. a[art2, pg 36]-Richard Corben. Color. Created: October 4, 2000. Modified: November 23, 2015.